Handmade, hand crafted leather boots...Quality inside out! Traditional Western Styling with a flair. 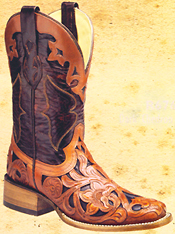 CORRAL BOOTS are made by the finest leather Craftsmen in this world. Throughout the last century, expert boot makers have journeyed to Leon, Mexico, to join the heart of boot making country, in all of America. 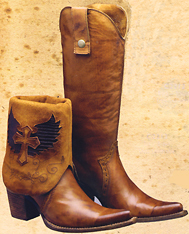 Only the most experienced boot craftsmen, in Leon, create Corral Boots. And only the finest materials are used to handcraft your boots. Not only the finest grade of exotics, but the finest of all materials! Inside and out. What you don't see is just as important as what you do see. The leather sole system, with all sorts of foot fitting innards, provides a shock absorbing, arch supporting, surface for most casual and dress wearing conditions. Proper foot care now, will pay tremendous dividends in all your years to come. Cheap made shoes create all sorts of problems years from now. And soft bottom tennis shoes, designed for active sports, were never made to wear all day. Cultured Cowboy is your dealership, offering many major brands. 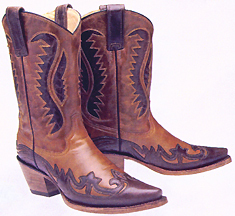 If you are looking for a work boot or western boot style that you can't find, just call or email. We'll be glad to get it for you at a very fair price. We walked into this company over 10 years ago. They make a really superb boot. Your arches are supported. The soles and mid soles are substantial. Good guts & good looks. Ya don't get funny smells! The best leathers are used. The reason we went with them, was that they made a handmade belly cut python boot that we sold well; but that was getting harder to find. ( We sell a lot of better Python boots.) You will see that the back of the python is a regular boot. (The belly is a make up.) Why bother? Most you guys know Cultured Cowboy as the "special make-up" store. We'll get it when others won't try. That belly snake boot is still a great seller! If a company will work with us on special make-ups, we want to try work with them on all their boots. When other boot companies scared us with extreme "X Toes", Corral made an American Boot with an X toe; not some weird looking "way out there" only good for a fashion season, toe. The sole and heel have proper, comfortable angles and arches. Linings are glove leathers. They may not be the fastest delivery, (sometimes, the are fast! ), but they are among the best at what they do...thus, worth any reasonable wait. Most boots are 2 to 16 weeks. And, we stock a bunch of them as we can! Corral boots are not using any endangered animals. Alligators & Ostriches are a farm grown food source in many parts of the world. Good ecosystems depend on not wasting any part of any animal. Caiman is a smaller alligator, much easier to work with as a leather, than the more labor intensive American alligator that costs $1400.00 & up. This caiman alligator tail boot has a lot of textured detail without huge "wings" at the toe. Classy. The Caiman Alligator Head boot is actually cut from neck toward shoulders of the reptile. On each boot, take a look at the detailed stitch and well thought-out matching design on the shaft. Nice. The patterns make the shaft stay new looking longer, yet flexibility easily allows for your comfort. Fanciful pull tabs. These boots will look as good on your shelf as home decor, as they do on your feet. 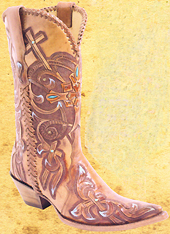 Each Corral Exotic Boot has these beneficial specifications: Leather outsole on an all leather upper. Brushed goat uppers for durability and comfort. Glove lining. Hand lasted toe. Slightly underslung walking heel. Handcrafted by experienced artisans. This Caiman Alligator boot is appropriate for even the more formal occasions, (especially in black). With jeans, it is dressed down enough to work as a higher value, tough looking, (says - I am my own man / woman) comfy boot. Order ASAP to get these remarkably low prices on your exotic boots. What makes this boot special is the interesting way that the shaft of your boot divides the heel foxing from the front vamp. Cognac color Caiman Tail foot. (Sometimes called Peanut Brittle) Leather outsole on an all leather upper. Glove lining. Choose R (med round), or X (handmade narrow point) toe. Slightly underslung walking heel. Handcrafted. Burnt Apple (Also called Burgundy) color Caiman foot. Leather outsole on an all leather upper. Glove lining. Choose R (med round), or X (handmade narrow point) toe. Slightly underslung walking heel. Handcrafted. Natural color Caiman foot. Leather outsole on an all leather upper. Glove lining. Choose R (med round), or X (handmade narrow point) toe. Slightly underslung walking heel. Handcrafted. The sizes 8 - 12 & 13, D & EE are often in stock, or take just a little time to get. Sizes outside these ranges usually have to be made up as a special, and take longer to get to you. 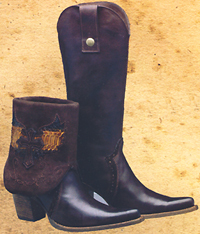 Full Quill Ostrich is known to be one of the most comfortable western dress boots in the world. Full quill ostrich skin is durable. It is thicker than other bird skins and is applied to another layer of leather liner for support. Full Quill Ostrich breathes. The large quill marks have a large pore that allows easy dissipation of foot moisture. The ease of sweat dissipation is why sometimes a de-salter is needed to remove white marks. For light lines, you can just use a wet rag and let the boots dry at room temperature. Always recondition after a deep cleansing. Really, these feel like a sock with a sole. And they are easy to keep looking great for a long time! Women's sizes 6 - 9 are usually pretty fast delivery. Other sizes are usually made as the orders come in. Black Cherry color Full Quill Ostrich foot. 11 inch top. Leather outsole on an all leather upper. Glove lining. Handmade Rounded Point (X toe. Underslung riding heel. Handcrafted. Indian Pink color Full Quill Ostrich heel counter and Vamp. 13 inch top. Leather outsole on an all leather upper. Glove lining. Medium Round (R) toe. Slightly underslung riding heel. Handcrafted. Cherry red color Full Quill Ostrich foot. 11 inch top. Leather outsole on an all leather upper. Glove lining. Handmade Rounded Point (X toe. Underslung riding heel. Handcrafted. Genuine Full Quill Ostrich wingtips, on a Smooth Ostrich vamp, will give you a sock-like feel with a sole. This placement of exotic skins on the boots puts the most ventilation in the toe box area, where it is needed. Since there is much more area of the ostrich bird without the larger raised quill marks, this Smooth Ostrich vamp makes this style a little special. A great looking ostrich wingtip boot at an affordable price. Men's 6 - 12, & 13 are usually pretty fast. Other sizes are usually made as the orders come in. We left these boots (Men's sizing) on the Ladies Boot page, because many ladies with larger or wider feet will find these styles to be feminine enough to wear. Black Cherry (Burnt Apple) color Full Quill Ostrich wingtip on a Smooth Ostrich foot. 13 inch top. Leather outsole on an all leather upper. Glove lining. Medium Round toe (R toe). Slightly underslung walking heel. Handcrafted. Oryx (bone) color Full Quill Ostrich wingtip on a Smooth Ostrich foot. 13 inch top. Leather outsole on an all leather upper. Glove lining. Medium Round toe (R toe). Slightly underslung walking heel. Handcrafted. Cango Tobac (Chocolate) color Full Quill Ostrich wingtip on a Smooth Ostrich foot. 13 inch top. Leather outsole on an all leather upper. Glove lining. Medium Round toe (R toe). Slightly underslung walking heel. Handcrafted. Teju Lizard boots are made from the belly side of the reptile. This cut allows an easy breakover as you stroll along. No need to stitch the vamp. It falls in shape perfectly without the stitches. Lizard is scratch resistant. Dressy. Lizard boots have a small vee cut on each side of the vamp to allow some ease as you pull it on & off. Ladies 6 - 10 & Men's 6 - 12, & 13 are usually pretty fast. Other sizes are usually made as the orders come in. Black color Teju Lizard foot. Leather outsole on an all leather upper. Glove lining. Choose R (med round), or X (handmade narrow point) toe. Slightly underslung walking heel. Handcrafted. Chocolate (Also called Sport Rust) color Teju Lizard foot. Leather outsole on an all leather upper. Glove lining. Choose R (med round), or X (handmade narrow point) toe. Slightly underslung walking heel. Handcrafted. Black foot Bone shaft Teju Lizard foot. Leather outsole on an all leather upper. Glove lining. R (med round) toe. Slightly underslung walking heel. Handcrafted. Chocolate (Also called Sport Rust) color Teju Lizard foot. Natural Python Eagle inlays. Leather outsole on an all leather upper. Glove lining. X (handmade narrow point) toe. Slightly underslung riding heel. Handcrafted. Sizing: 5 -10, 11, 12 Ladies Medium and Wide widths. Never has there been a more scratch resistant boot. Stingray exotic boots have a sheen to them, a pebble looking surface, and a long life expectancy. These boots are made from the back side. This cut allows an easy breakover as you stroll along. No need to stitch the vamp. It falls in shape perfectly without the stitches. Dressy or casual...This boot easily goes both ways. Pink color Stingray boots with Vintage Brown shaft. Leather outsole on an all leather upper. Glove lining. Handmade pointed (X) toe. Slightly underslung riding heel. Handcrafted. Zebra Print on Stingray boots. Leather outsole on an all leather upper. Glove lining. Square toe. Cross trim on shaft. Slightly underslung walking heel. Handcrafted. Beige color Stingray boots with Vintage Brown shaft. Inlays. Leather outsole on an all leather upper. Glove lining. Handmade pointed (X) toe. Slightly underslung riding heel. Handcrafted. 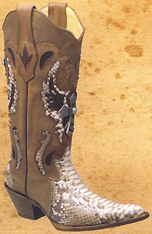 Corral brand Python Boots give you a boot with an outer shell of snakeskin, over an inner shell of leather. This adds support and strength to your Western boots. Extremely form fitting to your individual foot's features. Almost no break-in period, because the top leathers are so comfy. Red Python boots with Black shaft. Python inlays. Leather outsole on an all leather upper. Glove lining. Handmade pointed X toe. Slightly underslung riding heel. Handcrafted. Sky Blue Python boots with Brown shaft. Python inlays. Leather outsole on an all leather upper. Glove lining. Handmade pointed X toe. Slightly underslung riding heel. Handcrafted. Ladies Golden Brown Python boots with Brown shaft. Leather outsole on an all leather upper. Glove lining. Handmade pointed X toe. Slightly underslung riding heel. Handcrafted. Ladies Ocean Blue Python boots. Cross Inlays on shaft. Leather outsole on an all leather upper. Glove lining. Handmade pointed X toe. Slightly underslung riding heel. Handcrafted. Linden Green Python boots with Brown shaft. Python inlays. Leather outsole on an all leather upper. Glove lining. Handmade pointed X toe. Slightly underslung riding heel. Handcrafted. Mystic Blue Python boots. Python inlays. Leather outsole on an all leather upper. Glove lining. Handmade pointed X toe. Slightly underslung riding heel. Handcrafted. Chocolate Python boots with Tan highlights & med brown shaft. Python inlays. Leather outsole on an all leather upper. Glove lining. Handmade pointed X toe. Slightly underslung riding heel. Handcrafted. Green & Brown Python boots. Belly of the snakeskin. Cross inlays. Leather outsole on an all leather upper. Glove lining. Handmade pointed X toe. Slightly underslung riding heel. Handcrafted. Pink / Brown Python boots with Vintage Brown shaft. Python inlays. Leather outsole on an all leather upper. Glove lining. Handmade pointed X toe. Slightly underslung riding heel. Handcrafted. Ladies Musgo (Brown) Python boots. Cross Inlays on Distressed Chocolate Goat shaft. Leather outsole on an all leather upper. Glove lining. Handmade pointed X toe. Slightly underslung riding heel. Handcrafted. Ladies Black / Gray Python boots. Cross Inlays on Black Distressed Goat shaft. Leather outsole on an all leather upper. Glove lining. Handmade pointed X toe. Slightly underslung riding heel. Handcrafted. Light Green tint Python boots. Back of the snakeskin. Python & Cross Inlays. Leather outsole on an all leather upper. Glove lining. Handmade pointed X toe. Slightly underslung riding heel. Handcrafted. Natural Python Ladies boots. Python inlays & Jeweled Cross on Brown shaft. Leather outsole on an all leather upper. Glove lining. Handmade pointed X toe. Slightly underslung walking heel. Handcrafted. Multi-color Blue Python Ladies boots. Python trim on pulls and shaft. Leather outsole on an all leather upper. Glove lining. Handmade pointed X toe. Slightly underslung walking heel. Handcrafted. Natural Python Ladies boots. Python inlays & Jeweled Cross on Black shaft. Leather outsole on an all leather upper. Glove lining. Handmade pointed X toe. Slightly underslung walking heel. Handcrafted. Black / White Natural Python Ladies boots. White leather inlays & Nickel studs on Black shaft. Leather outsole on an all leather upper. Glove lining. Handmade pointed X toe. Slightly underslung walking heel. Handcrafted. Natural Python Ladies boots. Python inlays & Nickel studs on Distressed Brown shaft. Leather outsole on an all leather upper. Glove lining. Handmade pointed X toe. Slightly underslung walking heel. Handcrafted. Natural Python Ladies boots. Python inlays & Nickel studs on Deep Brown shaft. Leather outsole on an all leather upper. Glove lining. Handmade pointed X toe. Slightly underslung walking heel. Handcrafted. Handtooled boots have more than a fascination associated with them. As you wear them, you share the artistry of the boot maker. Each pair is well matched and beautifully crafted by the most experienced in this business. Leather Western boots say a lot about who you are as you add the flames, flags, and florals. Corral Boot Co will be glad to take your artistic designs and make a bid for you own special art or logo. All you need is the art, a little patience and a little money. Wear them in pride! Yes, we will have a pair of Corral Boots sent to you to try for sizing before the costs of making a custom design on a wrong fit. Tinted Brown tones of Natural Python Trimmed Ladies boots. Soft chocolate lamb skin shaft. Leather outsole on an all leather upper. Glove lining. Handmade pointed X toe. Slightly underslung walking heel. Handcrafted. Brown Lizard Trimmed Ladies boots. Soft tan lamb skin convertible shaft. Leather outsole on an all leather upper. Glove lining. Handmade pointed X toe. Slightly underslung walking heel. Handcrafted. Black / White Natural Python Trimmed Ladies boots. Soft black lamb skin convertible shaft. Leather outsole on an all leather upper. Glove lining. Handmade pointed X toe. Slightly underslung walking heel. Handcrafted. Tinted tones of Black / Brown Python Trimmed Ladies boots. Soft chocolate scrunch leather shaft. Leather outsole on an all leather upper. Glove lining. Handmade fashion toe. Ladies tall fashion heel. Handcrafted. Side Zipper. Tinted tones of Teal and Grey on a crackle leather Ladies boot. Leather outsole on an all leather upper. Glove lining. Handmade fashion toe. Ladies tall fashion heel. Handcrafted. Side Zipper. Tinted tones of Black / Brown Python Trimmed Ladies boots. Matching exotic skin shaft. Leather outsole on an all leather upper. Glove lining. Handmade fashion toe. Ladies tall fashion heel. Handcrafted. Side Zipper. Antique Brandy / Chocolate. Hand crafted leather boots. Cowboy eagle overlay pattern. Matching wingtip and foxing. Leather outsole on an all leather upper. Glove lining. 13 inch top. Handmade pointed (X) toe. Underslung riding heel. Handcrafted. Mink / Chocolate on Sierra Pullup leather. Hand crafted leather boots. Cowboy eagle overlay pattern. Matching wingtip and foxing. Leather outsole on an all leather upper. Glove lining. 13 inch top. Handmade pointed (X) toe. Underslung riding heel. Handcrafted. Golden Tan with Black trim leather. 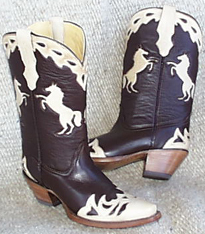 Hand crafted goat leather boots. Cowboy eagle overlay pattern. Matching wingtip and foxing. Leather outsole on an all leather upper. Glove lining. 13 inch top. Handmade pointed (X) toe. Underslung riding heel. Handcrafted. Tan / Chocolate on Sierra Pull-up leather. Hand crafted leather boots. Cowgirl wings shaft pattern. Matching wingtip and foxing. Leather outsole on an all leather upper. Glove lining. 13 inch top. Handmade pointed (X) toe. Underslung riding heel. Handcrafted. Ladies natural cross & fashion inlays on golden calf leather. Hand crafted leather boots. 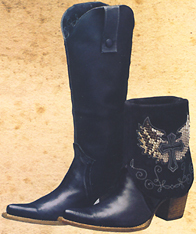 Cowgirl wingtip & foxing pattern. Matching wingtip and foxing. Leather outsole on an all leather upper. Glove lining. 13 inch top. Handmade pointed (X) toe. Underslung riding heel. Handcrafted. Ladies short top bone tribal overlay pattern on distressed goat leather. Hand crafted leather boots. Nickel spots. Leather outsole on an all leather upper. Glove lining. 9 inch top. Handmade pointed (X) toe. Underslung riding heel. Handcrafted. Ladies natural trim of fashion overlays & fashion inlays on Tabac color deertan leather. Hand crafted leather boots. Cowgirl wingtip, foxing & scallop patterns. Leather outsole on an all leather upper. Glove lining. 13 inch top. Handmade pointed (X) toe. Underslung riding heel. Handcrafted. Ladies colorful trim of handtooled floral & butterfly fashion accents. Turquoise brilliance on Black leather. Hand laced. Hand made leather boots. Wingtip, foxing & scallop patterns blend artistically. Leather outsole on an all leather upper. Glove lining. 13 inch top. Handmade pointed (X) toe or Narrow round (J) toe. Slightly underslung walking heel. Handcrafted. Ladies natural trim of fashion overlays & fashion inlays on Chocolate color deer tan leather. Hand crafted leather boots. Cowgirl wingtip, foxing & scallop patterns. Rearing horses on all 4 shaft panels. Leather outsole on an all leather upper. Glove lining. 13 inch top. Handmade snip toe. Underslung riding heel. Handcrafted. Ladies Handtooled floral fashion overlays over Black Chocolate leather. Complementing scallop pattern. Leather outsole on an all leather upper. Glove lining. 11 inch top. Rounded Square toe. Super Roper heel. Handcrafted. Ladies Handtooled flourishes surround crosses. Touches of turquoise color highlights. Hand laced. Leather outsole on an all leather upper. Glove lining. 11 inch top. Handmade Ladies Fashion toe. Underslung riding heel. Handcrafted. Although Corral Boots does not offer matching belts or accessories, Cultured Cowboy has a lot of them in exotics and leathers. Just visit www.culturedcowboy.com and look through all the offerings. Alligator boots need a reptile conditioner and delicate cream for conditioning. These products are designed to condition the scales and the membranes between the scales of the exotic skin. Then, use a matching cream polish to protect the boot from scuffs, or to cover existing scuffs. Ostrich boots need a delicate cream for conditioning, and sometimes a de-salter to remove salt from the skin. ( If you see white lines after wearing, you need a de-salter.) These products are designed to recondition this exotic skin. Leather balm can be used to clean ostrich. Then, use a matching cream polish to protect the boot from scuffs, or to cover existing scuffs. Lizard boots and Snakeskin boots use a spray reptile cleaner/conditioner to help clean the scales and membranes. Use delicate cream to condition. Use a matching or neutral cream paste to protect the skins. When you take them off, get in a habit of wiping down the lizard with your socks to remove dust particles. Use the same products the same way on Stingray, but a soft bristle brush is helpful to work the products between all the materials. There may be several boot care products you are interested in. Just ask about what all you may enjoy...boot hooks, boot jacks, horsehair brushes to apply and polish, etc. We have it all for you. You see, we want these boots to last a good long time for you! Just a little care will make them go a lot farther. Be sure to wipe the dust and dirt off the skins with a soft cotton cloth each time you take them off after wearing. This keeps dust and dirt from cutting into the leathers.